Teachers understand one secret to a successful class is engaging their students. These fun solid-colored Listening First Headphones are built to do just that with playful Blue color. Purpose built with the proper age-appropriate size and weight for day care to elementary school-aged students, these unique headphones are ideal for computer-based programs (including testing to meet Common Core State Standards), literacy and language learning activities, read alongs in classrooms, library and lab settings. Safety was a design priority for the Listening First headphones with slotted earcup baffles protecting the internal speakers against accidental perforation by sharp objects. Noise-reducing earcups rest around not in the ears to provide maximum protection against ambient noise so students won't increase the volume to hear the content. The rugged ABS plastic earcups won't shatter (unlike materials used in consumer electronics items) into potentially dangerous shards and withstand the rigors of daily use to help children remain focused on learning. The entry point of the cord into the earcup is reinforced. The 3.5mm stereo plug enables student listening to smartphones, tablets, computers and other audio sources. Creating a small group of differentiated learners is possible with the use of a stereo jackbox. 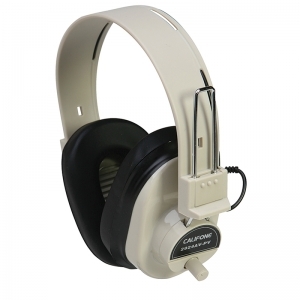 Optional disposable hypoallergenic cloth earpad covers (2800EC) are available for headphones in high use settings. Students and teachers tell us the covers help make the headphones feel even cooler, are comfortable to wear and help keep the earpads clean. The solid-colored Listening First headphones come with an industry leading two-year warranty. Long-lasting headphones with safety features such as recessed wiring to avoid curious little fingers. Features include. Volume controls are independently set by the teacher for student protection. Appropriately sized, lightweight and comfortable for beginning readers. 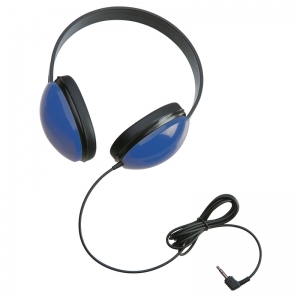 Durable ABS plastic earcups can withstand the most enthusiastic learners. 3.5mm stereo plugs connect to most popular media players. Adjustable ABS plastic headband. 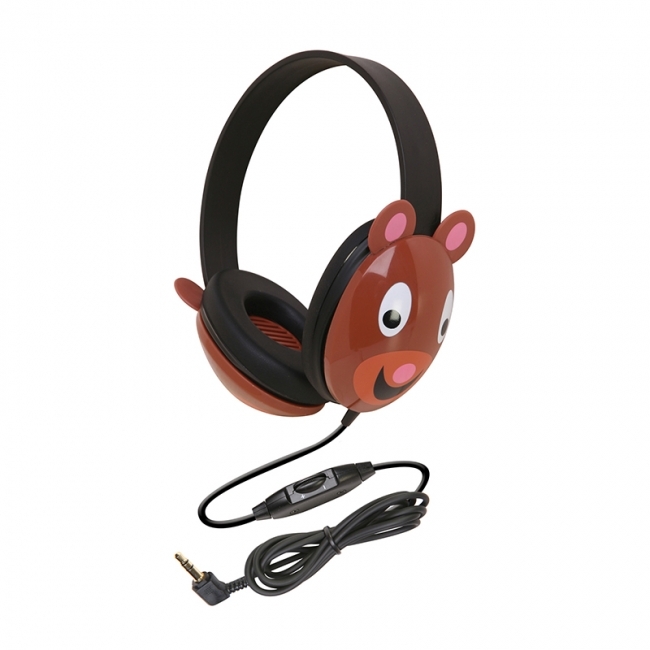 Califone Listening First Kids Wired Headphone in Bear Design has an adjustable headband that offers comfort for extended wear. Headphone is designed for young students and is ideal for beginning computer classes and story-time uses. Headphone gives volume control for individual preferences and comes with ambient noise-reducing ear cups to deliver maximum protection against exterior sounds. Headphones are reinforced strain connection to resist accidental pull out. Lengthy 6 ft straight cord with 3.5 mm plug set at right angle helps to reduce an accidental pull-out. Bear headphone features rugged ABS plastic ear cups that resist breakage in high-use situations. 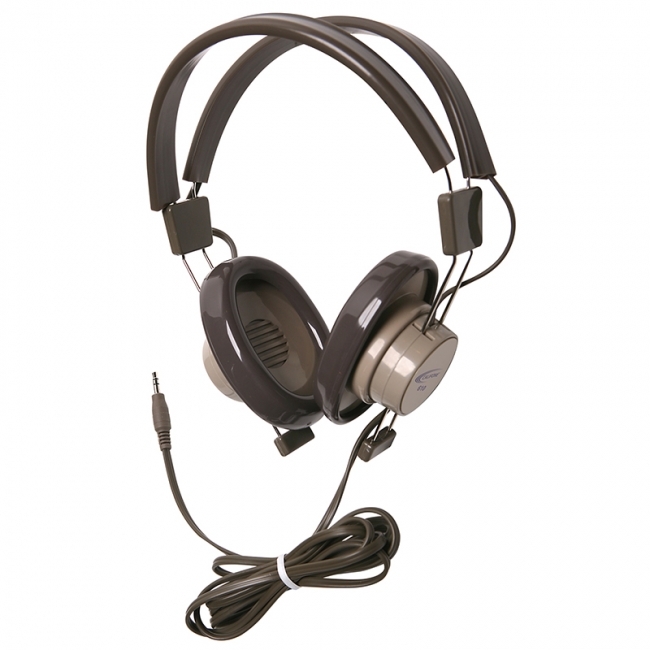 Headphone featuring replaceable leatherette ear cushions and are compatible with Mac and Windows. 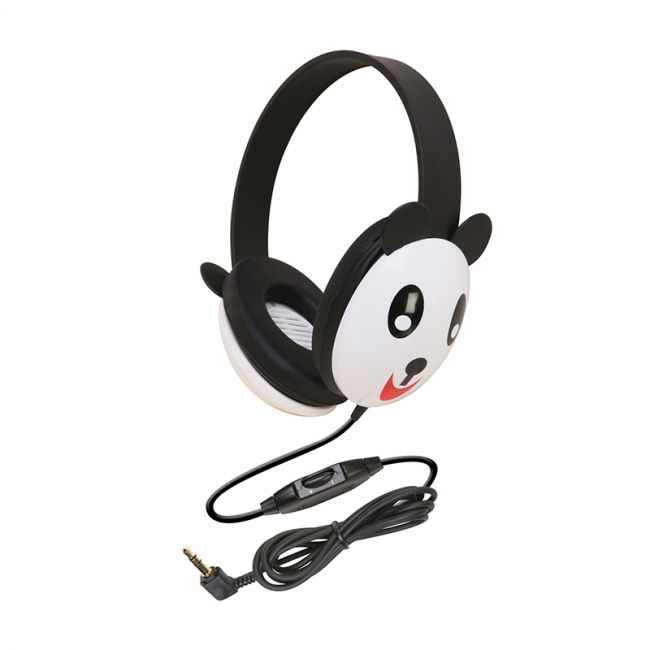 Califone Listening First Kids Wired Headphone in Panda Design has an adjustable headband that offers comfort for extended wear. Headphone is designed for young students and is ideal for beginning computer classes and story-time uses. Headphone gives volume control for individual preferences and comes with ambient noise-reducing ear cups to deliver maximum protection against exterior sounds. Headphones are reinforced strain connection to resist accidental pull out. Lengthy 6 ft straight cord with 3.5 mm plug set at right angle helps to reduce an accidental pull-out. 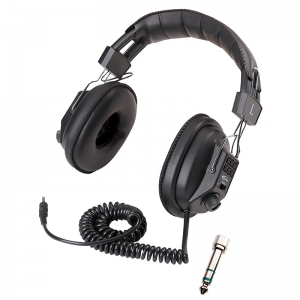 Headphone features rugged ABS plastic ear cups that resist breakage in high-use situations. 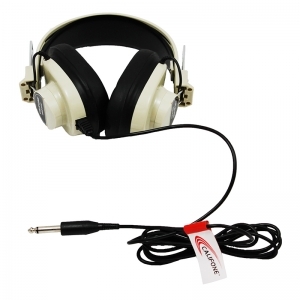 Headphone featuring replaceable leatherette ear cushions and are compatible with Mac and Windows. 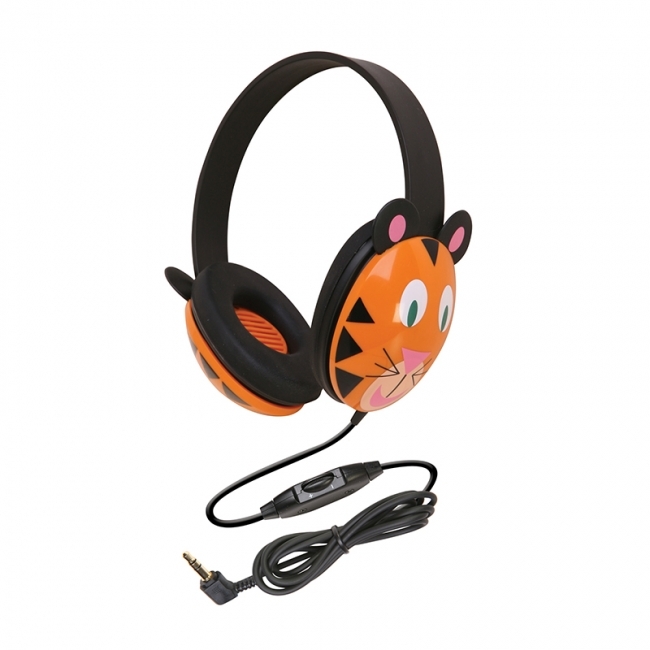 Califone Listening First Kids Wired Headphone in Tiger Design has an adjustable headband that offers comfort for extended wear. Headphone is designed for young students and is ideal for beginning computer classes and story-time uses. Headphone gives volume control for individual preferences and comes with ambient noise-reducing ear cups to deliver maximum protection against exterior sounds. Headphones are reinforced strain connection to resist accidental pull out. Lengthy 6 ft straight cord with 3.5 mm plug set at right angle helps to reduce an accidental pull-out. Headphone features rugged ABS plastic ear cups that resist breakage in high-use situations. 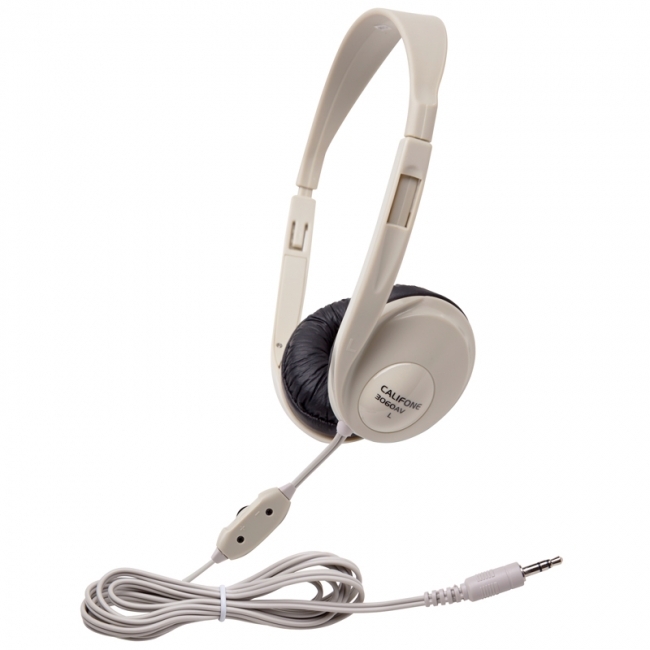 Headphone featuring replaceable leatherette ear cushions and are compatible with Mac and Windows. Built for student comfort and ruggedness, it delivers high quality voice reproduction that's critical in ELL and ELD lessons, day to day classroom uses and assessments. It has comfy, noise-reducing circumaural earcups designed to minimize external distractions and keep students more on task (which also decreases the need to raise the volume to potentially damaging levels). 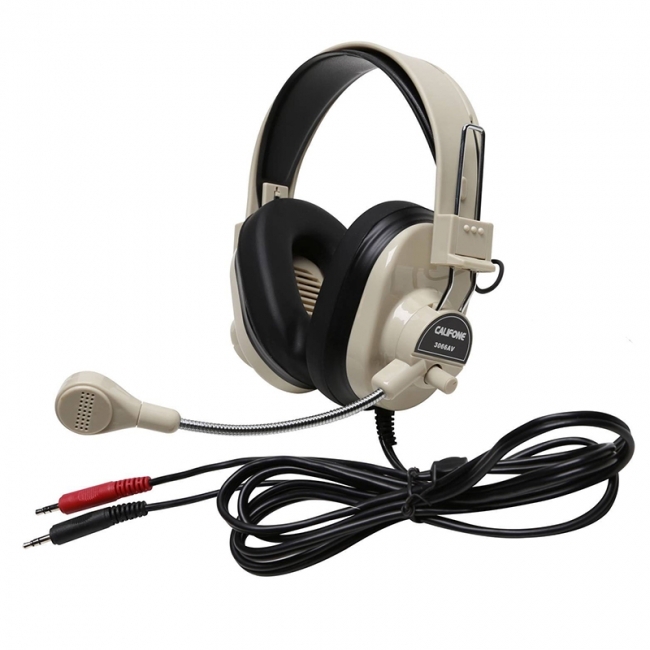 This Deluxe Stereo headphone is the educator's standard for multimedia, computer labs, listening centers, and language learning activities. 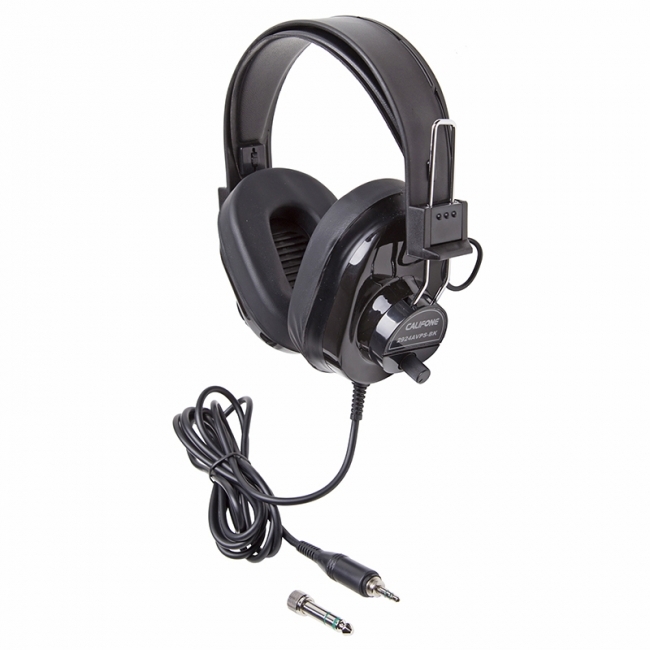 Built for student comfort and ruggedness, it delivers high quality voice reproduction that's critical in day to day classroom uses, STEM activities, and assessments. It has comfy, noise-reducing circumaural earcups designed to minimize external distractions and keep students more on task (which also decreases the need to raise the volume to potentially damaging levels). Its audio playback is calibrated to enhance the tonal range of the human voice for use in language learning. Black. 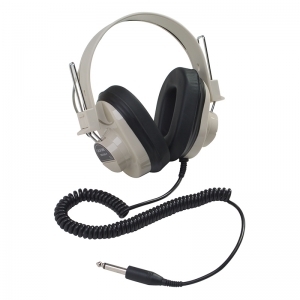 These lightweight and fully adjustable stereo headphones are ideal for extended listening by students in classrooms, labs and libraries. Great for multimedia learning environments, they're just right for computer-based language learning (ELL / ELD) programs and literacy applications to help meet the English Language Arts portion of the Common Core State Standards. In-line volume control gives customized sound to maximize each student's learning experience, and ambient on-ear noise-reducing replaceable earcups provide hearing protection for students. The 3066 Deluxe Multimedia Stereo headset is designed for small group or independent learning in computer labs, online or in classrooms and libraries. The 3066 offers ambient noise-reducing, over-ear earcups to help students stay more on task while minimizing the need to increase the volume for hearing protection. Its noise-reducing boom microphone is ideal for vocal recordings and is the recommended headset by leading reading programs. The individual volume control gives students a comfortable and customized sound experience that's valuable for sustained practice in literacy or language programs and help support the ELA requirements within the Common Core State Standards. Around-ear ambient noise-reducing earcups deliver maximum protection against exterior sounds (without added electronic circuitry and expense). This reduces the need to increase the volume (protecting the ears) and helps keep students on task. 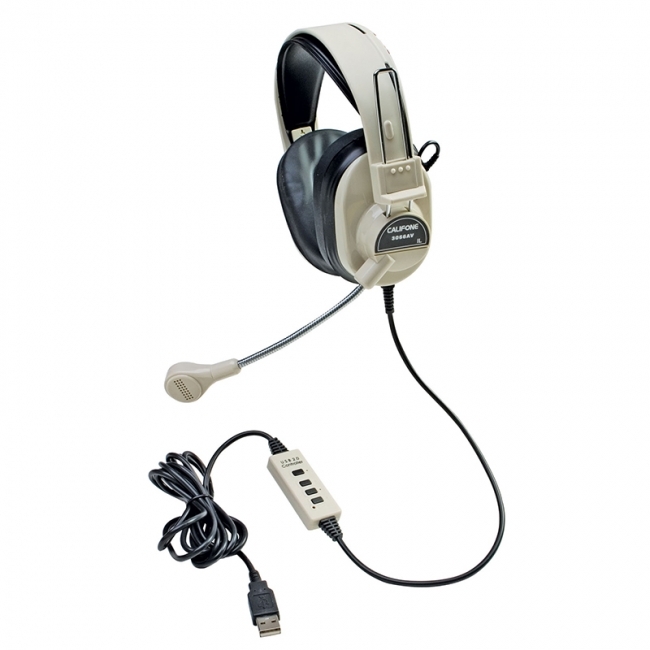 The Deluxe Stereo Headset is designed for language learning in today's classrooms. 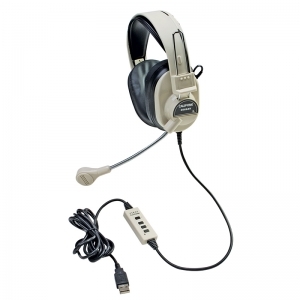 This compact, adjustable headset is ideal for high speed internet listening, language learning and tutorials in computer labs and other multimedia applications as well as a web phone. The 610 binaural headphone has long been used to support literacy development. The 610 is designed to stand up to frequent student use and is one of the best values for schools. Designed to comfortably fit either younger students or adults, schools depend on the durability of the 610 to maximize their investment in audio technology. The 610 headband has a "memory" feature that no matter how they're bent or twisted, they remember their original shape and spring back contributing to longer product life. Windows, Android and MAC compatible. 3.5mm stereo plug, non-replaceable cord.